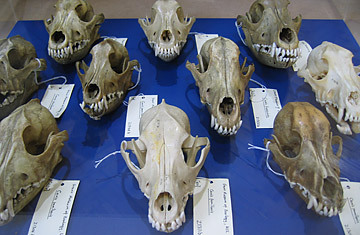 Dog Skulls from the collection in University College London, Museum Photos courtesy of UCL Collections. If you're the type of person who has trouble throwing anything out, then the job of collections reviewer at the University College London's museums might not be for you. The college is embarking upon a purge of its assorted collections, some 250,000 items in total, only 2% of which are currently on display. A gargantuan task, surely, but the college is not doing it on its own  officials have taken the unusual step of opening the process up to the public. They're asking visitors what they should keep, what they should give away to other museums  one institution's trash is another's treasure  or, as a last resort, what they should just throw away. "Disposal is still a dirty word. Most museum people are too scared to use it," says Jayne Dunn, UCL's collections manager. "We work for the public, but no one's ever thought of asking them what they want." Many of the items in the university's collections, which range from ancient archeological artifacts to outdated scientific instruments to radioactive geological samples, were acquired over the years by professors who used them in their research. Other items were donated by other museums or private individuals. Now, the university's museums, like many institutions today, are looking to clear some space so they can continue collecting. And not everything in its collections are treasures  hence, the artifact cull. Consider the boring old picnic basket known as the "Agatha Christie basket," which contains fragments of pottery of unknown origins. If it had belonged to the author, as its nickname would suggest, it would undoubtedly be a keeper; however, it turns out it belonged to her second husband's second wife, and the university has no idea under what circumstances it was donated. Or what about a giant rhinoceros skull? Is that worth keeping? How about the samples of earth dug up from the English Channel, pre-Chunnel? Hundreds of beautiful hand-drawn lecture slides made by the scientist Sir Ambrose Fleming, inventor of the diode? Or the slides of microscopic fossils, which don't seem to take up much space until you consider there's a quarter million of them in storage? The public also got the chance to vote on what they would save during a showdown between five of the university's professors, each of whom passionately defended an item dear to their hearts: a mass-produced gouache painting of Mt. Vesuvius, a marsupial mole preserved in formaldehyde, a 1960s toy car, an ancient fragment of painted wall plaster from what is now a London suburb and a collection of Victorian-era death masks. One professor put it best: "These objects don't have an intrinsic value." But each has an interesting back-story. The toy car, for example, belonged to a child who suffered from a condition that led him to try to eat everything; subsequently, he suffered from lead poisoning from chewing off the car's paint. Ultimately, however, the marsupial mole won the audience's vote. The fun and games at UCL is attracting the attention of some of London's major museums, including visits from collections officials at the British Museum, the Fashion Museum and the Imperial War Museum, says UCL collections review assistant Subhadra Das. "I think they're finding it quite liberating," she says. "We're in a lucky position being a university collection, because we can talk about things that maybe bigger museums feel they can't." Though most museums around the world have strict policies on disposal (some prefer the term "deaccessioning"), they rarely shine a light on the process. They have reason to  there have been numerous public outcries over downsizing collections in recent years, especially when museums try to sell items. Cash-strapped Brandeis University in Waltham, Mass., was sued in July by art donors for moving to shut down its Rose Art Museum and sell off part of its $350 million collection. Last month, the university backed down and agreed to forgo the sale. To be sure, not everything in a museum's collection is worth keeping, let alone putting on display. Das puts it diplomatically: "Sometimes [donors]bring us wonderful things, and sometimes, well, they're not quite for us." See the top 10 crazy celebrity collectibles. Watch video: "Arshile Gorky: The Shape Shifter"